The first-ever biography of Ferran Adrià, the chef behind Spain’s renowned El Bulli restaurant, by one of the world’s foremost food authorities. More than just the most influential chef of the late-twentieth and early-twenty- first century, Ferran Adrià is arguably the greatest culinary revolutionary of our time. Hailed as a genius and a prophet by fellow chefs, worshipped (if often misunderstood) by critics and lay diners alike, Adrià is imitated and paid homage to in professional kitchens, and more than a few private ones, all over the world. A reservation at his one and only restaurant, El Bulli, is so coveted that scoring a table is harder than nabbing fifty-yardline tickets to the Super Bowl. 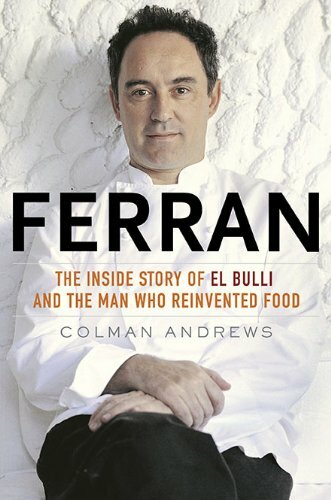 In his lively close-up portrait of Adrià, award-winning food writer Colman Andrews traces this groundbreaking chef’s rise from resort-hotel dishwasher to culinary deity, and the evolution of El Bulli from a German-owned beach bar into the establishment voted annually by an international jury to be “the world’s best restaurant.” Taking the reader from Adrià’s Franco-era childhood near Barcelona through El Bulli’s wildly creative “disco-beach” days and into the modern-day creative wonderland of Adrià’s restaurant kitchen and the workshop- laboratory where his innovations are born and refined, Andrews blends sweeping storytelling with culinary history to explore Adrià’s extraordinary contributions to the way we eat. Through original techniques like deconstruction, spherification, and the creation of culinary foams and airs, Adrià has profoundly reimagined the basic characteristics of food’s forms, while celebrating and intensifying the natural flavors of his raw materials. Yet, argues Andrews, these innovations may not be his most impressive achievements. Instead, Adrià’s sheer creativity and courageous imagination are his true genius-a genius that transcends the chef’s métier and can inspire and enlighten all of us.